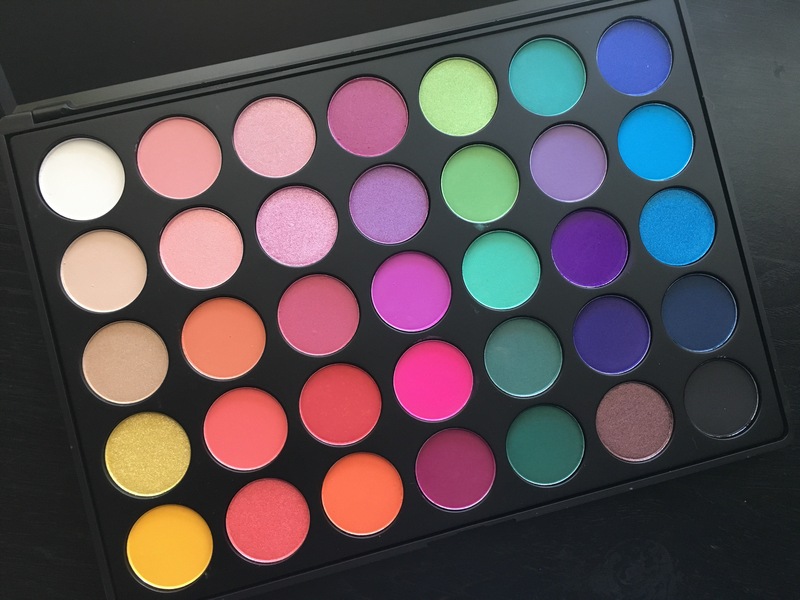 The Morphe 35b palette is the perfect palette for anyone who loves creating bright, fun eye looks and experimenting with color! This palette is not a new product or anything, but I was so excited to add this to my makeup collection and create so many fun looks out of it, starting with today’s. Today’s makeup look was also inspired by makeup artist, Linda Hallberg. She is by far the person I go to when I need some makeup inspiration. 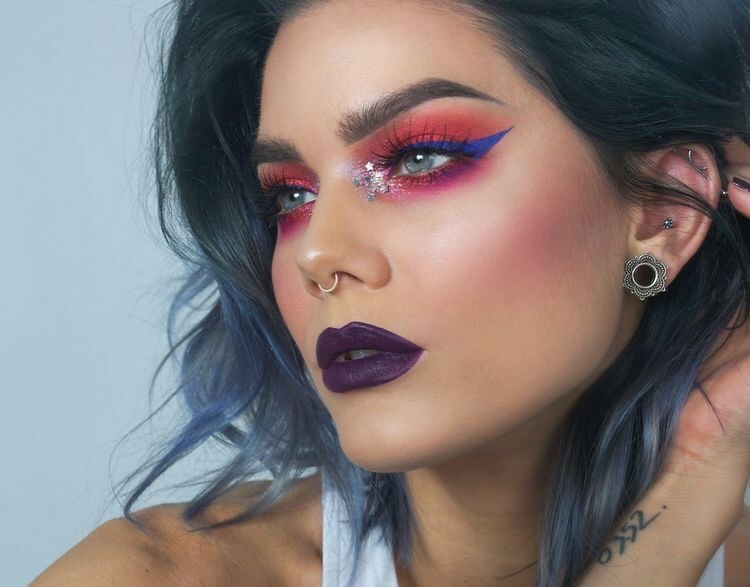 Her work is absolutely amazing and so different from any other makeup artist that I follow. For my recreation of this look, I used a more toned down glitter in the inner corner and added a little bit on the outer corner of the eye as well. Linda used a deep plum lip color and I decided to use a brighter shade to add another pop of color. Keep scrolling to see a full list of the products I used to create this look and as always, follow me on Instagram @marinaleebeauty for more pics! I contoured my face using the Physician’s Formula Butter Bronzer. For blush, I used the tarte Amazonian Clay Matte Blush in shade Exposed. I wanted to keep the blush very neutral and toned down to keep the focus on the eyes and lips. Highlighted using the Makeup Revolution baked highlighter in Golden Lights. Primed my eyes using the Wet N Wild PhotoFocus eye primer. I set the lid and brow bone area with the white eyeshadow from the palette. 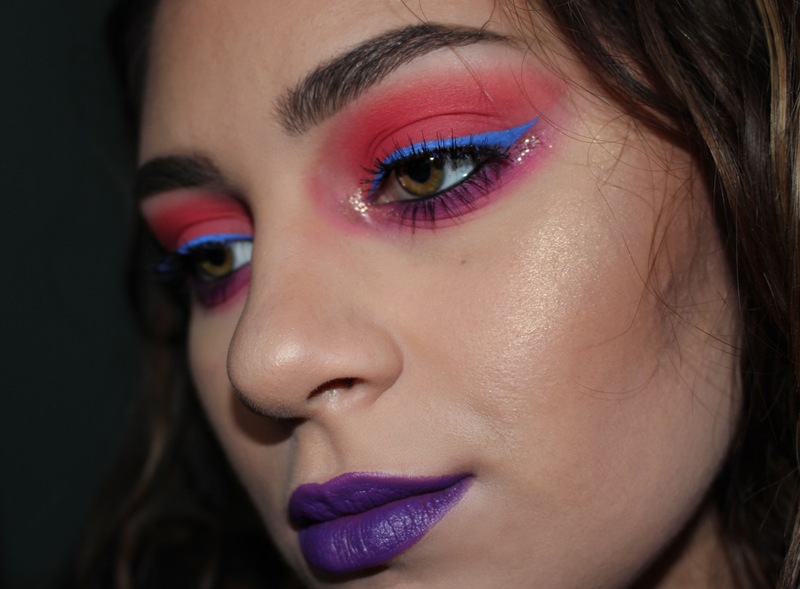 I used the lighter red shade in the crease as the tradition shade, then went in with the true red shade and packed this all over my lid and blended it into the crease, winging it out as well. I kept packing on this shade to intensify the color. For the bottom lashline, I smoked out the hot pink shade, then smudged the medium purple shade closer to my bottom lashline. I created a winged liner using the Wet N Wild liquid eyeliner in Voltage Blue. I added some gold pressed glitter from Wet N Wild to the inner and outer corners of my eyes. I applied a good coat of the L’Orea Vuminous Carbon Black mascara to my top and bottom lashes, then applied some falsies (Andrea lashes). I filled in my brows using the Anastasia Beverly Hills Dipbrow Pomade in Medium Brown. I only used one product for the lips, Maybelline lipstick in Violet Vixen from their Bolds collection. Gorgeous palette, those colors are amazing! Omgg okay I can assure you that I am now #1 fan of your blog haha!! Beautiful! Aww thank you!! 😘😘 so glad you like it!! It’s so good! I never thought I would use a palette like this but I absolutely love it!